For Fumo and the IRS, this is only round one. Now that the jeopardy assessment has been struck down, the IRS and Fumo will slug it out again in tax court. The IRS claims that Fumo owes them more than $3 million in back taxes, fines and penalties on money stolen from the state Senate, the non-profit Citizens Alliance for Better Neighborhoods, and the Independence Seaport Museum. Cedrone, however, maintains that his client owes the IRS "zip." "Hopefully, the winds are now shifting for Senator Fumo," Cedrone said. "We still have some battles to fight in tax court." Maybe that's why Cedrone's client was less than exuberant over his victory. "It always feels good to be vindicated," Fumo said. "My joy is tempered because this is not over yet." 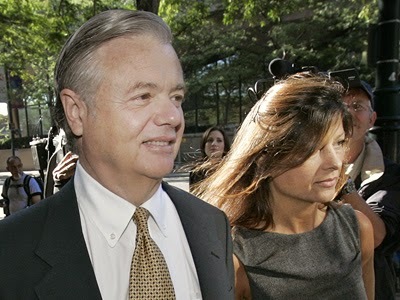 On March 6, 2009, former state Senator Fumo was convicted by a federal jury on 137 counts of conspiracy, fraud, obstruction of justice and filing a false tax return. He was fined $2.7 million and sentenced to 55 months in jail by Buckwalter. But the federal prosecutors who put Fumo away didn't think it was enough. They appealed the sentence and won. In November 2011, Judge Buckwalter re-sentenced Fumo to 61 months in jail, upping his prison time by 6 months; the judge also boosted Fumo's fines and restitution by more than $1.1 million, to nearly $4 million. "To date, Plaintiff has paid nearly $4 million to the United States in fines, restitution, and assessments in connection with his criminal convictions," Buckwalter wrote. Fumo served four years in jail until he was released on Aug. 2, 2013 and sentenced to serve the rest of his sentence under home confinement. "He is presently on supervised release," Buckwalter wrote. After Fumo's criminal conviction, the IRS assigned Agent Kenneth J. Kelly to review the transcripts and exhibits from the criminal trial, to determine whether the IRS could nail Fumo for any back taxes, fines and penalties related to the fraud. Kelly plowed through the transcripts and trial exhibits. Oct. 3, 2012, he mailed Fumo a notice saying that for tax years between 2001 and 2005, the IRS had determined that Fumo owed $2 million. Five months later, on March 21, 2013, an IRS agent visited Fumo in prison in Ashland, Kentucky, and served him with the jeopardy assessment. The IRS was notifying Fumo that they had increased his tax bill to $3 million. Under terms of the jeopardy assessment, the feds were also putting Fumo on notice that they had frozen three of his bank accounts totaling $2.7 million. The only reason why the feds hit Fumo with the jeopardy assessment, as far as Judge Buckwalter could determine, was because they read an article in The Philadelphia Inquirer. You'll never read about this in our city's paper of record. But it's all spelled out in Buckwalter's 63-page memorandum. "According to Agent Kelly," Buckwalter wrote, "'the IRS learned, through a newspaper article, that [Fumo] had effectively disposed of most of his real property interests,' which prompted the IRS to evaluate whether a jeopardy assessment should be made against" Fumo. The Inquirer story was published on Oct. 21, 2012 under the byline of Craig R. McCoy and Miriam Hill. The headline: "Fumo shifts property ownership, keeps quarreling." "The newspaper article," Buckwalter wrote, "describes the government's efforts to have [Fumo] pay an additional [nearly] $800,000 in restitution." The feds had filed a second appeal, seeking to extract from Fumo another $783,284 in restitution. In the Inquirer article, it appeared as though Fumo, upset about the prospect of having to pay the government any additional restitution, was jugging his money and property for nefarious reasons. "The [Inquirer] article describes, among other topics, Plaintiff's resistance to paying the increased share of restitution, the real estate transactions detailed in the IRS declarations, and Plaintiff's claims that he transferred properties to avoid the impending increase in federal gift taxes scheduled to take effect the following January," Buckwalter wrote. "The article quotes federal prosecutors who have promised to collect any additionally-ordered restitution either from the fiancee's windfall or from the many other assets owned by Fumo," Buckwaler wrote. On top of what he owed for the 2001-2005 tax years, the IRS had decided that Fumo should be assessed an addional $327,895 in unpaid gift tax liabilities for 2009, plus an extra $132,798 in fines for failing to pay the gift tax on time. The IRS levied the unpaid gift taxes and fines on $2.8 million in transfers between Fumo and his son, Vincent E. Fumo II. The IRS claimed that the movement of funds "is suspicious and appears to be designed to hide the original source of the money," the judge wrote. The feds claimed the transfers were made for "no known purpose." Included in the transfers was $920,000 from a fund jointly held by Fumo and son to an account in the son's name only. Fumo, however, contended the money was transferred to pay his bills while he was still in jail, including more than $1 million in fines and restitution already owed the federal government. The Inky reported that the feds were investigating the transfers of seven of Fumo's properties to his son and fiancee for less than fair market value. The properties included a home in Ft. Lauderdale sold for $2.3 million in 2012. Fumo's fiancee, Carolyn Zinni, received more than $1 million from that sale; the rest of the money, $1.1 million, was used to pay fines and restitution to the government. -- A condo in Margate, N.J. with a fair market value of $1.1 million; Fumo transferred that property to himself and Zinni for $10. -- A 99-acre farm in Halifax Pa. with a fair market value of $337,552 transferred to Zinni for $1. Fumo stated in a declaration that he transferred his entire interest in the farm, rather than a survivorship interest, "in recognition of many years of faithful, loving devotion" by Zinni. Every month he was in jail in Kentucky, Fumo wrote, Zinni drove nine hours one-way to visit him. -- Property at 936-40 S. 13th St. in Philadelphia with a fair market value of $130,000 transferred to Fumo and son for $1. -- A condo at 660 Mommouth Ave., Ventnor, N.J. with a fair market value of $525,000 transferred to a joint ownership for Fumo and son for $10. -- Fumo's mansion on Green Street with a fair market value of more than $3 million was transferred from sole ownership by Fumo to a joint ownership between Fumo and son for $10. Fumo maintained in court that he was transferring the properties under the advice of an accountant. Fumo was preparing for "the scheduled expiration of exemptions from estate and gift taxes commonly known as the "Bush tax credits" that expired on Dec. 31, 2012, the judge wrote. "My goal is to become as judgement proof as possible," Fumo wrote his ex-wife. "I want to 'own nothing but control everything'" after which Fumo made a smiley face. "I never want to be this vulnerable to the government or any creditors again in my life!" Fumo wrote. "These fines & restitution were a grossly unfair outrage!" after which Fumo made a frowning face. Fumo maintained to Buckwalter that when he wrote to his ex-wife, he was trying to enlist her aid in his efforts to renegotiate the terms of a $1.4 million loan he had borrowed from the trust fund to pay the fines and restitution he owed the government. Those remarks he wrote to his ex-wife, according to Fumo, were not about "any IRS concerns," the judge wrote. In reviewing the imposition of the jeopardy assessment, the judge went over the ground rules for such a drastic penalty. And he found that none applied to the Fumo case. A jeopardy assessment, according to U.S. Treasury regulations, can be applied if the taxpayer "appears to be designing quickly to depart from the United States to conceal himself," the judge wrote. The jeopardy assessment can also be imposed if the the taxpayer "appears to be designing quickly to place his property beyond the reach of the government by removing it from the United States," the judge wrote. The third and final reason a jeopardy assessment can be imposed is when the taxpayer is in danger of going broke. In Buckwalter's view, however, Fumo and son were able to "rationally explain" the property and money transfers that had attracted the attention of the Inquirer and the feds. Fumo was about to go to jail for four years. "It is certainly plausible that [Fumo] took a series of steps to arrange for his son to manage his affairs," the judge wrote. It doesn't necessarily "create the appearance" of hiding his money from the feds, which is necessary for a jeopardy assessment. "Overall, the actions taken by [Fumo and son] have the appearance of two people trying to mange [Fumo's] expenses, bills and financial obligations leading up to and during [Fumo's] incarceration," the judge wrote, "not the appearance of trying to hide money from the government." In reality, all details of the transactions were "known to the government," the judge wrote. The government had contended that Fumo's expressed written desires to his ex-wife to "control everything and own nothing" were part of a plan to conceal assets from the government, the judge wrote. Fumo, however, "still owns an interest in the properties at issue, and therefore has not removed them from actual or potential creditors." Also, the judge wrote, Fumo reported all the property transfers in a timely fashion to the government. That "undermines any notion of 'a plan to hide assets' from his creditors," including the IRS, the judge wrote. The government saw Fumo's 2010 letters from prison as a confession "where [Fumo] revealed his plan to avoid any exposure to creditors or the government," the judge wrote. But Fumo wasn't judgment proof. A year after he wrote those letters, Fumo had to pay $1.1 million in further restitution to the government, the judge wrote. So the judge dismissed Fumo's letters to his ex-wife as the "idle complaints" of a guy sitting in jail trying to figure out how to pay his bills. But Fumo is in no danger of going broke, one of the requirements for a jeopardy assessment, the judge wrote. Fumo still has $2.7 million in assets frozen by the feds. The former state senator is still a "wealthy man," the judge wrote. Going through past cases, the judge noted that the jeopardy assessment had been applied to a guy who a month after he found out he was the target of a grand jury investigation, transferred $3 million to an account in the Cayman Islands. In Fumo's case, all of the transferred properties, except the farm, are still owned by Fumo, his son and/or his fiancee, and are not "beyond the reach of the government," the judge wrote. The judge noted that when the IRS first hit Fumo with a back tax bill of $2 million in October 2012, they did not levy a jeopardy assessment. Five months later, in March 2013, when the IRS raised the bill to more than $3 million and levied the jeopardy assessment, "no suspicious activity" had transpired in the interim that would have required the imposition of a jeopardy assessment, the judge wrote, other than the publication of the Inquirer story. In essence, the the judge was saying, he was throwing out the jeopardy assessment because the feds had overreacted to a misleading newspaper story.